Unpleasant stains on the bath spoil your mood? You spend hours rubbing dirt away, but it's no use. Fortunately, there are enough good and effective ways to deal with them. How to clean the acrylic bath from yellow spots, which use household chemicals, as well as folk remedies, tell the article. If you have porcelain or enamel types of baths - read, there is also information on cleaning them. To begin, let us point out the nuances applied to different types of materials that should be known during the cleansing operation. Depending on the type of material from which the bath is made, the care for it will vary. Porcelain is one of the most durable materials. Strongly aggressive types of cleaning products should not be applied to it. Enamel can be seen on the old types of baths. It is very sensitive to some types of household chemicals - in this regard, care must be taken. For example, in the bath may appear very unattractive brown spots that resemble rust. This result is achieved when the cleaning was done with a strong acid or bleach. Acrylic in its parameters is very similar to plastic. It bends easily and is therefore susceptible to damage during careless maintenance. This type of material cannot be cleaned using different abrasives. For example, pumice. Let's move from unpleasant things to effective action. How to clean the bath of yellow spots, if it is made of porcelain, will tell the next chapter. Good results in cleaning can be achieved if you use an abrasive powder. Marks Comet and Ajax are perfect for this. It has been said above that strong abrasives are contraindicated for this type of material. Therefore, the choice was made in favor of a soft powder of famous brands, which is able to effectively clean all dirt and stains from the bath. Pour it over the contaminated area and add some cold water. Use the sponge to scrub. The most hard side of it around rubbing pollution. They should get off quickly. How to wash the yellow stains in the bathroom, which are difficult to remove? Use pumice as a tool. It is better if, in addition, before this, Comet will be mixed with water. All spots are smeared on them and left on 30 minutes. And then pumice is put into operation, which will well remove all grime. 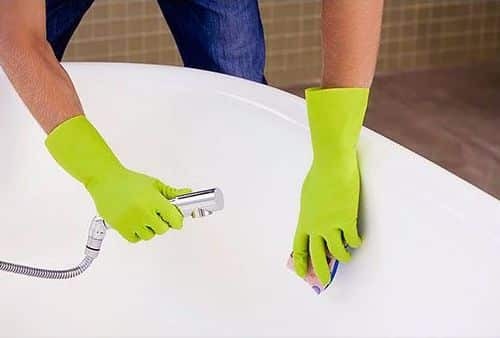 Please note: abrasives generally can not be used when cleaning acrylic and enamel baths - they will leave ugly scratches on the walls. How to remove stains in the bathroom, if it is enameled, the next chapter will tell. The first thing you should try to clean the most common detergents. The main thing is to make sure that they do not contain chlorine. Stains near the drain holes can be successfully cleaned with a regular shampoo for hair. They spread the problem surface around the drain, left for a few minutes and then washed off with warm water. Shampoo is designed to deal with fatty compounds, which are the cause of the appearance of dirt in the bath. For difficult to remove and especially persistent stains, trisodium phosphate should be used. But it is recommended to do this only in extreme cases. A tablespoon of this solution is diluted in three liters of hot water. It is important to use this cleaner separately from other household chemicals in order to avoid an adverse reaction. apply a spray that removes soap traces. We gradually moved to a common type of pollution - yellow spots on the acrylic bath. What to clean and by what means - the next chapter will tell. This type of bath should be washed more often than the others. By frequency, the ideal option would be once a week. For cleaning, use ordinary dishwashing liquid and hot water. Traces of high water hardness and yellow spots will effectively remove vinegar. It should be applied to places of pollution, leave for thirty minutes and then wipe with a soft sponge. Only use products that do not have strong abrasive properties. This will help avoid damage to the bath surface. When cleaning, it is better to use only soft household chemicals. For example, Soft Scrub Hand Cream is very effective in dealing with blemishes. Some housewives use wax to give the bath a shiny surface. Should not be doing that. 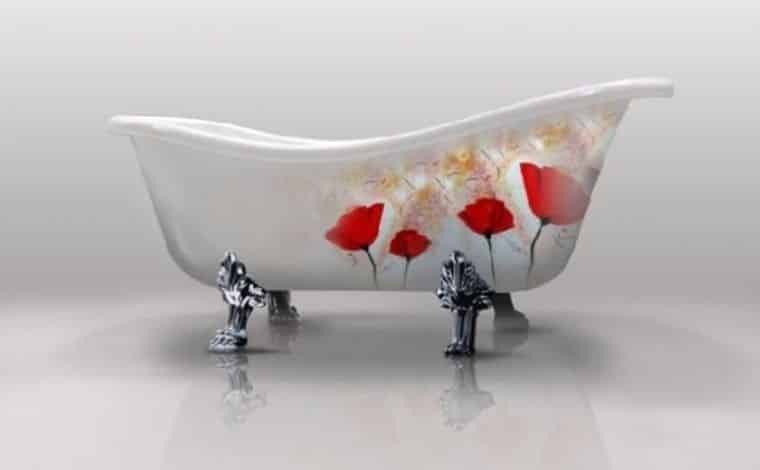 If you follow all the principles of how to remove stains from an acrylic bath, then it will remain smooth and beautiful and without additional funds. There are effective folk remedies to combat pollution. Consider them. The standard is a mixture of soda and ammonia. The solution is prepared before the formation of gruel. Then it is applied with rubbing movements on the polluted area, left for thirty minutes and washed off with warm water. A good tool in the fight against stains is lemon juice. It should be preheated, evenly distributed over the entire contaminated surface and left for half an hour. And then rinse with warm water. How to remove stains on acrylic bath folk methods? For this purpose, use ordinary laundry detergent. It is gently rubbed over the entire surface, and then washed off with warm water. The operation is repeated until all contamination has been cleared. To prevent stains from forming as long as possible, you need to know a few points on how to prevent them from appearing. It consists of a series of measures that need to be carried out regularly. The first step is to rinse the bath after each use. Then you should wipe it dry with any soft cloth. Once a week it is necessary to clean the bath using soft products. This will prevent the rapid appearance of plaque, grease and other such contaminants. Do not leave even small portions of liquid. Yellow spots on the bathroom are formed precisely because of them. Another reason for this pollution is the poor quality of tap water. Therefore, always install filters to avoid further cleaning problems. How to clean the yellow stains in the bathroom using metal sponges and brushes? According to some housewives, the harder the tool, the better it cleans. But it is not. To eliminate the possibility of scratches on the bath surface, it is better not to apply any products with metallic inclusions when leaving. Summing up, you can see that the bath can be cleaned and traditional methods, and using household chemicals. The main thing is to use them under a certain material - acrylic, porcelain or enamel.